This Disclaimer aims to set out and regulate the user guidelines for the www.tur4all.com, www.tur4all.es and www.tur4all.pt sites (hereinafter the "Sites") and Tur4all App (hereinafter, the App). In accordance with Spanish Organic Law 3/2018, of December 5, Protection of Personal Data and guarantee of digital rights and the Regulation (EU) 2016/679 of the European Parliament and of the Council of 27 April 2016 on the protection of natural persons with regard to the processing of personal data and on the free movement of such data, please be informed that www.tur4all.com and www.tur4all.es web sites are the property of PREDIF, THE SPANISH REPRESENTATIVE PLATFORM FOR PEOPLE WITH PHYSICAL DISABILITIES (hereinafter, "PREDIF"), with registered offices in Avenida Doctor García Tapia, 129, Local 5, 28030, Madrid Tax ID no. G81629370, which also, in collaboration with FUNDACIÓN VODAFONE ESPAÑA (hereinafter, "FVE"), through its mobile application and online services, collects the personal data of users of the TUR4all application and web site. In accordance with the Regulation (EU) 2016/679 of the European Parliament and of the Council of 27 April 2016 on the protection of natural persons with regard to the processing of personal data and on the free movement of such data, please be informed that www.tur4all.pt web site is property of ACCESSIBLE PORTUGAL (Asociación de promoción del Turismo Accesible), with registered offices in Rua das Figueirinhas, 8 – 2630-099 Arranhó – Portugal Tax ID no. 514 058 358, which also, in collaboration with FUNDACIÓN VODAFONE PORTUGAL (hereinafter, "FVP"), through its mobile application and online services, collects the personal data of users of the TUR4all application and web site. If you have any questions, please do not hesitate to contact us at the following email addresses info@tur4all.com (Spain) and/or info@tur4all.pt (Portugal). 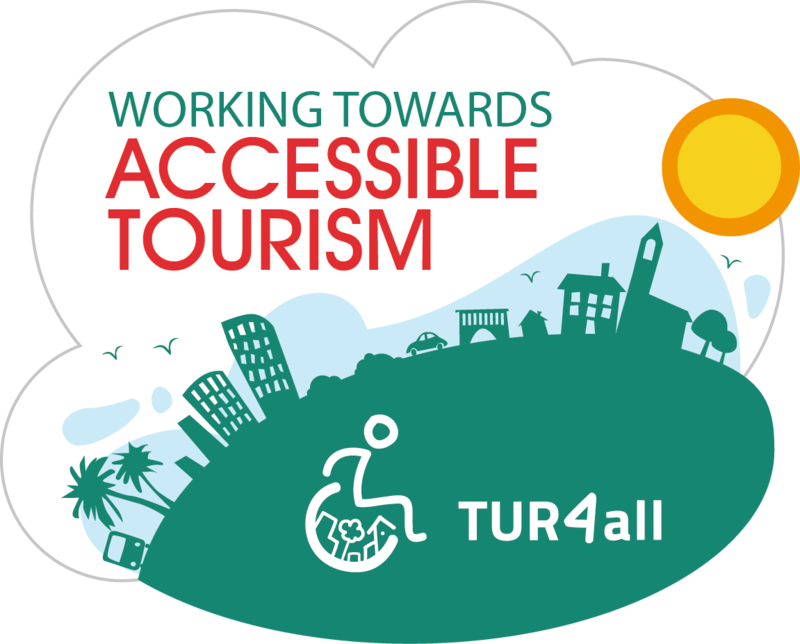 The TUR4all web sites and App are tools whereby tourists with accessibility needs have more autonomy when it comes to either planning their trip prior to leaving or once at their destination. Tur4all has a search function where users can select establishments based on country, province/county or region, town/city or by category (accommodation, bars and restaurants, tourism offices, monuments, culture, trade fairs and congresses, nature and beaches, leisure, shopping, sports facilities, health resorts and spas, public toilets, banks and cash dispensers, healthcare resources, parking, transport and tourism routes; hereinafter, all of them, the "establishments" and/or "restaurants, places and sites ") or by using advanced search criteria (accessibility criteria). Additionally, the App comes with a "Nearby" feature, which allows users to identify nearby accessible tourism resources using a geolocation system. TUR4all is multilingual, and interacts with social networks and enables users, by way of a simplified questionnaire, to publish content (hereinafter, "User Content") about the accessibility of newly added establishments, locations and sites, as well as add photographs of them and provide feedback about the accessibility of existing establishments, becoming as such influencers and evaluators of accessible tourism establishments. The personal data provided by users is designed for private use and using it for commercial purposes is strictly forbidden. To be able to take advantage of certain Interactive Services, which offer not only the opportunity to publish “User content” but also to evaluate the accessibility of establishments, users must first register, and this requires certain personal details to be provided such as a photograph and information regarding any accessibility needs that the user might have, for example. Data that can be viewed consist of the photograph and an "Alias". Visible activities shall consist of their User Content and comments. User access to Interactive Services is achieved by registering on either the web site or the App. Users can also register using their social network profiles (Facebook, Twitter) provided it is authorised by the user. The use of the Sites/App implies full acceptance by the user of these conditions, and as such if they do not agree with their content, they should refrain from using the Web Sites and the App, or the services contained therein. If they choose not to accept them, they shall not have access to all the functions of the Web Sites and App. Until the conditions are accepted, the application can be installed but it will not collect personal data of any kind, nor will they have access to the functions specifically for registered users. PREDIF and ACCESSIBLE PORTUGAL reserve the right to carry out any changes them deem appropriate, such as modifying, deleting or adding new content and/or services, at a moment’s notice, as well as the way in which these are displayed or located, in addition to the conditions of use of the web site/App. Use the web site/App to carry out unlawful or immoral activities or those that are contrary to pub-lic order, in general, or to the lawful and reputable use in accordance with these General Terms and Conditions and shall refrain from any action that might potentially damage, render inoperable, overload or impair the web site and/or impede normal use of other Users. Manipulate or change content on the web site/App that they do not have access to as a registered user without the express written consent of its owner. Any change, modification or tampering without the consent of its owner, exempts the owner from any responsibility. Reproduce, copy, distribute, publicly communicate, change or modify the content, unless they have the required authorisation of the owner of the corresponding rights unless said action is legally permitted; or delete, bypass or tamper with the Copyright or other identifying data belonging to PREDIF and ACCESSIBLE PORTUGAL or those of its owners contained within the content, such as technical protection devices, or any other reporting mechanism that might contain the aforementioned content. Add or disseminate data programmes (viruses or any kind of harmful software) on the web site/App likely to damage the web site. PREDIF and Accessible Portugal do not guarantee the availability and the continuity of the web site/App nor shall they be held responsible for any damages that might occur, or any technical faults, including viruses or other harmful elements of any kind, stemming from the use of information and materials contained on the web. PREDIF and ACCESSIBLE PORTUGAL do not guarantee the continual access, nor the correct display, download or usefulness of elements and information contained on the pages of the portal that might be impeded, hindered or interrupted by factors or circumstances that are out of their control or through no fault of their own, nor those stemming from software viruses on the Internet. (i) Interferences, interruptions, errors, omissions, delays, blockages or disconnections, caused by errors in telecom lines and networks or for any other cause beyond the control of PREDIF. (iii) Improper or inappropriate use of the web site/App. (iv) Security or browsing errors caused by a browser malfunction or the use of outdated browsing software. Under no circumstances shall PREDIF and ACCESSIBLE PORTUGAL be held responsible or be answerable to users or third parties for acts carried out by third parties unbeknown to PREDIF and ACCESSIBLE PORTUGAL such as engaging in acts of unfair advertising or illicit advertising or any breach of intellectual and industrial property rights, trade secrets, contractual commitments of any kind, the rights to honour, personal and family privacy, of image, ownership rights or rights of any other kind belonging to a third party as a result of the transmission, distribution, storage, provision, receipt, or obtaining access to content. Responsibility for information about establishments. Provided by TUR4all registered users, together with the following message “Information about the accessibility of this tourism resource has been provided by users” and this pictogram. In the case of the latter, PREDIF and Accessible Portugal shall not be held responsible for the information and descriptions provided about resources or for their accuracy or recentness, given that it is provided by the users. Users acknowledge that all contents of the web pages and App, namely all information and materials, structure, selection, arrangement and provision of contents, programmes and the development of applications used in relation to these, are protected by intellectual and industrial property rights that belong to the owner of the web. Under no circumstances shall access or the use of them by users imply total or partial waiver, transmission or assignment of said rights, nor shall it give the right to use, alter, exploit, reproduce, distribute or publicly communicate said content without the prior express permission of PREDIF or the third party whose rights have been affected. PREDIF owns the elements that go to make up the graphic design of its web site/App, the menus, browsing buttons, code, texts, images, structure, graphics and any other content, or, in certain cases, possesses the appropriate authorisation to use them. All the brands, trade names or other distinguishing features belong to PREDIF and/or Accessible Portugal. Using them, permanently downloading them, distributing them by any means without the required consent of their owner is prohibited. Should any user or third party consider that any of the content added to the web page is in breach of their Intellectual and Industrial Property rights, they should notify PREDIF and/or Accessible Portugal, indicating who they are, the owner of the intellectual or industrial property rights that have been allegedly infringed, producing accredited ownership papers of representation for said rights. Connections and links to third-party web sites or pages have been provided solely as a service to users. Under no circumstances shall PREDIF and Accessible Portugal be held responsible for said pages or their content. PREDIF and Accessible Portugal shall not be held responsible for any links between the content of this site and the content contained elsewhere or any other reference to content not held within this site. The purpose of such links or references is purely informative, and under no circumstances, shall it imply support, approval, commercialisation or any relationship between PREDIF and Accessible Portugal and the authors and/or administrators of such content or the owners of the sites where they can be found. The creation of links to the web page requires the express written authorisation of the owners of the portal. To provide a better service, PREDIF stores tiny information files known as cookies on user’s computers. For more information about cookies and how to configure them, please see our Cookies Policy (Spain) / Cookies Policy (Portugal). Any information that either party communicates or provides to the other or has access to shall be considered confidential and shall not be disclosed, reproduced, copied, discussed with third parties, or used by either of the parties for anything other than their intended purpose. The General Terms and Conditions shall be governed by Spanish and Portuguese law. For any issues arising between the parties regarding the interpretation and enforcement of this document, both parties expressly agree to waive their right to any other jurisdiction in favour of the jurisdiction of the Courts of Madrid and Lisbon. Who are the data controllers? PREDIF, with registered premises at Avenida Doctor García Tapia, 129, Local 5, 28030, Madrid, Spain and Spanish Tax ID No. G81629370, together with ACCESSIBLE PORTUGAL, with registered premises at Rua das Figueirinhas, 8 – 2630-099 Arranhó – Portugal and Portuguese Tax ID No. 514 058 358, are the Data Controllers of the data provided by users of the Tur4all App (hereinafter, the App). You can contact PREDIF via email at the address found above, or via info@tur4all.com; or ACCESSIBLE PORTUGAL at the address found above, or via info@accesibleportugal.com. We can see your IP address, which operating system or browser you use, and even the length of time you spent on the site anonymously. By completing the registration form to create your profile, PREDIF shall process the identification and contact information needed to create the user profile, as well as those provided through the user control panel once the account has been created, such as your profile picture, telephone number, specific accessibility needs, or any other data, which you as a user choose to enter into the available fields. The purpose behind processing these data is to create and manage the user profile to be able to provide the service. Respond to any questions, requests or enquiries. Manage the requested service, respond to the enquiry or process your request. Provide information via electronic media, that concern your enquiry. Provide marketing materials or information about events via electronic media, provided express consent has been given. Carry out analysis and make improvements to the Web, or our products and services. Improve our marketing strategy. PREDIF and Accessible Portugal provide users via the Web with information about different courses or activities, to which the User can enrol by sending the enrolment forms via email and these can be downloaded from the Web. The Data Controller shall process the data contained on the form, as well as any documentation required to enrol (such as the disability certificates or payment receipts), in order to be able to provide and manage the service provided, namely, training or participation in the activity, depending on the particular case, and therefore the execution of a contract shall be the legal basis for data processing. To create your profile, PREDIF will process the identification and contact data necessary to be able to create the user profile, as well as those provided through the user control panel once the account has been created, such as your profile picture, telephone number, specific accessibility needs, or any other data, which you as a user choose to enter into the available fields, the purpose behind it is to create and manage the user profile to be able to provide the service that the App offers. Contacting the user should it be required. Improving the functions, utilities and precision of the Application and underlying technologies, as well as any content stored there. Improve and implement utilities and/or services in the application. Marketing materials or information about events via electronic media, provided express consent has been given. Access to the Interactive Services can be achieved with a user’s own social network profile (Facebook, Twitter) provided they have granted permission, and every time they publish content or add a new establishment to TUR4All, the entry will also be published on the user’s social network profile. Provided the user has given their consent and depending on the configuration of their device, the App will process geolocation data to identify the nearest accessible tourism resources using the “Nearby” tool, providing as such a better service. Interact with you and create a community of users. In this case, a contractual agreement shall be the legal basis for data processing, within the framework of the corresponding social network, and in compliance with its Privacy Policies, which is why both PREDIF and Accessible Portugal recommend reading them. Do we include data from third-party individuals? No, as a general rule, we only process an individual’s data if they provide it themselves. If we are provided data from a third party, they must have previously been informed and given their consent, otherwise we shall not be held responsible for non-compliance of this requirement. We do not process data from minors. Please therefore abstain from providing data if you are not an adult, or data from a third party who is not an adult. PREDIF and Accessible Portugal shall not be held responsible for those not complying with this norm. Will we send marketing material using electronic means? Information via electronic media regarding an enquiry. Carry out analysis and make improvements to the mailouts to improve our marketing strategy. You can relax: We have adopted an excellent level of protection of the personal data we maintain, and we have implemented all manner of available technical measure, according to the current state of technology to avoid any loss, misuse, interruption, unauthorised access or theft of Personal Data. Who shall our data be provided to? The Tur4all user community (only the alias and the user photo, if provided)), while the user is interacting publishing comments or adding content. Data handlers required for the provision of the service, who will have a signed service contract which compels them to maintain the same level of privacy as the data controller. Public Administration and Courts. If the authorities, such as the national law enforcement, Judges and/or Courts, request or demand information or if required to do so by law, PREDIF y Accessible Portugal shall send said third parties the data that they have formally requested. Should any of the concessions result in an international transfer of data using American applications, they shall be subject to the Privacy Shield Convention, which guarantees that American software companies comply with European data protection privacy policies. What rights does the user have? Knowing if their data is being processed or not. Accessing personal data being processed. Requesting the correcting of data if they are not accurate. Requesting the removal of data if they are no longer required for the purposes for which they were collected or if they withdraw their consent. Requesting the limiting of processing of data, in some instances, in which case they will be stored in compliance with current rules and regulations. Requesting the transferability of data, which shall be provided in a commonly used, or machine-readable structured format; or shall be able to be sent to the newly assigned data controller. This is only valid in certain instances. Filing a complaint with the Spanish Data Protection Agency or competent supervisory authority. Withdrawing consent at any time for any processing that might have been granted. To facilitate this procedure, and comply with the principle of data accuracy, if any data are modified, the Data Controller shall acknowledge notification of said change. To exercise the above rights, users should ask PREDIF and Accessible Portugal for a form or use those drafted by the Spanish Data Protection Agency or third parties in Spain. These forms should bear an electronic signature or should be accompanied by a photocopy of a photo ID; should the user have a representative, they should adjoin a copy of the user’s photo ID, or it should be signed with their electronic signature. Forms can be submitted in person, sent by regular mail or email to the address of the Data Controller that appears at the top of the text. Depending on which right is being exercised, PREDIF and Accessible Portugal shall take a maximum of one (1) month to respond to any request once it is received, and two months if it is a very complicated matter, in which case the user will be duly notified. Yes; for more information, please consult our Cookies Policy by clicking here: Cookies Policy (Spain) / Cookies Policy (Portugal), or via the link found on our home page. Personal data shall be stored provided there are still ties between us. Once the ties are broken, personal data processed, whatever their purpose, shall be kept for the period stipulated by law, including the period during which a judge or court requires them, in keeping with the statute of limitations. The processed data will be held provided the legal deadlines mentioned earlier have not yet expired, if there is any kind of legal duty to maintain them, or should there be no legal deadline in place, until the interested party requests they be deleted or withdraws their consent. We will maintain all the information and communications regarding the provision of our service while product and services guarantees are still in effect to be able to deal with any claims.